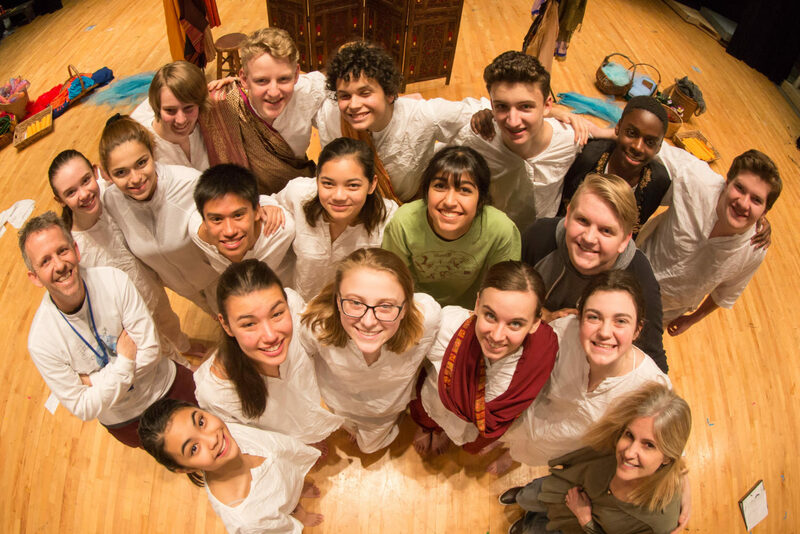 The One Act cast poses for a group picture following their first public performance of Siddhartha in October. The Stage Streaks celebrate their first place win at the 5D South Sub Regional One Act Competition. The cast will now be moving on to compete in regionals next Saturday, Feb. 2 at Albemarle High School. 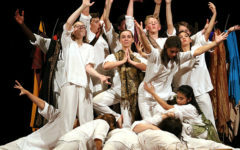 The weekend of Jan. 26-27 was an exciting one for members of this year’s One Act, Siddhartha. 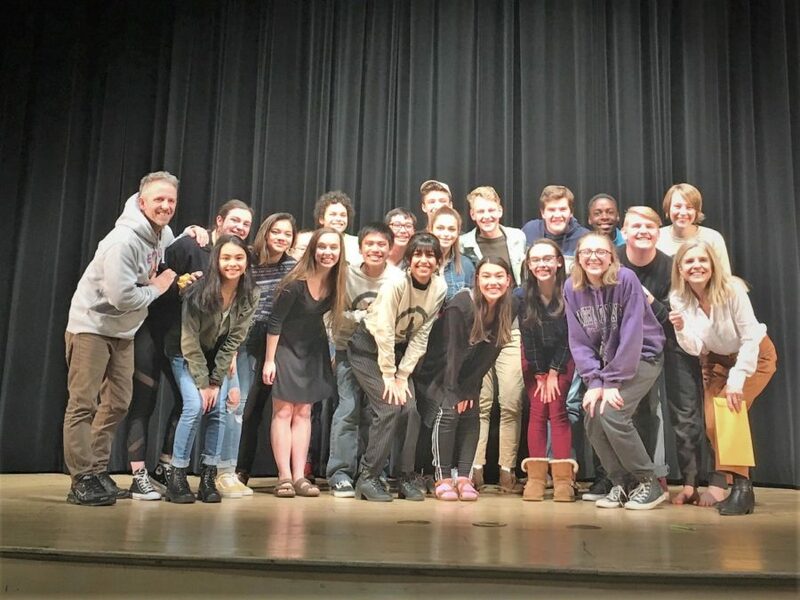 The members of the cast put on their first public performance in October, but have since competed in the 5D South Sub Regional One Act Festival. Competing against four other schools, Stage Streaks place first and will move on to compete in Regionals next Saturday, Feb. 2 at Albemarle High School. Director Ken Gibson asks that students try to come out and support their fellow Streaks at the competition, believing it could lead the team to States. For the past week, the cast has been balancing rehearsals with another upcoming performance: the Legally Blonde Musical. “The cast and crew were truly heroic on the day and throughout the week balancing school, Musical and One Act. Their commitment has been amazing – rehearsing on Musical days off, as well as after Musical rehearsal, even coming in at 6:45 am Saturday morning to rehearse before boarding a bus to Albemarle. These kids are an inspiration to myself and Assistant Director Susan Comfort,” Gibson said. In addition to winning first as a group, several cast members received various individual awards for their performances. 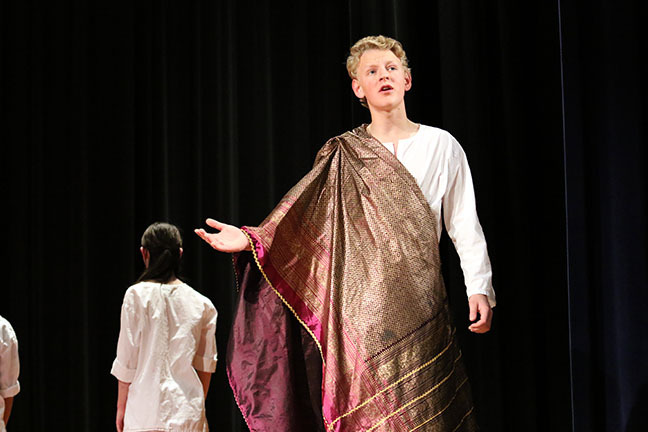 Junior Kate Cummings won Best Actor for her role of Siddhartha, and Senior Isaac Mast and sophomore Mariel Joven received All Star Cast honors for their roles of Old Siddhartha and Vasudeva, respectively. While the cast came away with several awards, Gibson believes there is an even more valuable aspect the the group. “Accolades alone do not reflect the team commitment of this group and their support for each other,” Gibson said. Additionally, Cummings, who previously competed in the Lexington Branch Shakespeare Competition at the Blackfriar’s Theatre, won the competition. She will now compete in New York City at Lincoln Center in a National Competition on the Bard’s Birthday weekend. “If you see any of the kids, please Congratulate them!” Gibson said. It’d be hard to argue that they don’t deserve it. Congrats to the Stage Streaks and good luck in their upcoming competitions. Senior Isaac Mast provides narration throughout the One Act's October performance. There was only a single moment of silence before the storm of screams. It took only a second for the crowd of hairspray scented, wide-eyed actors to realize that they’d just won. The One Act cast is now set to continue to Regionals on Feb. 2. As soon as senior Noah McIntire stepped off the stage, he knew their performance had the capability to go far. After faltering several times throughout the show, murmurs filled the backstage air. Among those concerned was junior Gia Yoder. Feelings leading up to the competition held a similar tone of nervousness, contradicting the relief following it. Since the start of the musical season in January, it has been difficult for the cast to find time to rehearse. Similarly, freshman Maya Pope went into Saturday’s competition nervous but excited. “Going into Saturday’s competition I was pretty nervous because we didn’t have that much rehearsal, but I still knew that we would do well because of how talented each cast and crew member is,” Pope said. Junior Danner Rebhun was one of the few cast members to go into the performance feeling comfortable and solid. She also believes that the cast will be able to improve leading up to the regional competition. Not only is the whole cast working together to improve their show, but each individual is putting in effort towards making themselves better. Freshman Sophia Yoder is working on her focus and vocalization before Saturday. 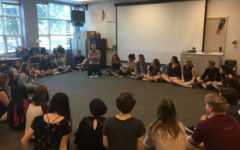 The past few days have been filled with buzz from the school’s One Act cast, whether in excitement or nervousness, maybe both. Awaiting Saturday’s performance, Gia Yoder is anticipating preparation and dedication from the cast.